My first visit to Costa Rica offered a view of the Basilisk Lizard that walks on water, and every visit since I've been fascinated with them. They are commonly called Jesus Christ Lizards. 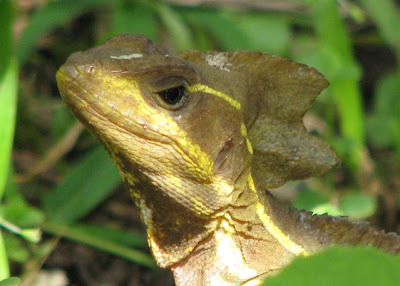 Here's some great information about this very cool lizard from CreationMoments.com. Would you like to be able to walk on water the way Jesus did? The closest human beings have come to walking on water is water skiing, which some even do without skis. But they still need a powerful and noisy power boat to do it. But there is an animal that can walk on water without help of any kind. The basilisk lizard is yet another tribute to God's unlimited creativity, knowledge and power. 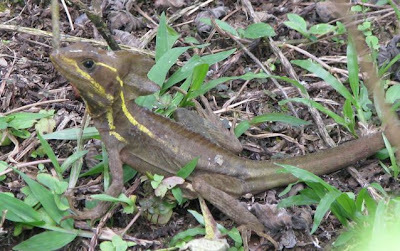 Basilisk are found from Mexico to Ecuador and are equally at home in the trees, on the ground and in or on the water. The basilisk is an excellent climber and can outrun any enemy on the ground. Since its back legs are proportionately longer than its front legs, when it needs extra speed, it can run just on its back legs. It runs so fast that it can run across the surface of a body of water that's up to 100 feet wide. That's impressive for a creature that can reach two feet in length! Skin flaps on both sides of its back toes, as well as scale fringes on the toes, help the basilisk to stay on the surface. Should the basilisk run into danger while crossing the water, it sinks beneath the surface and either swims or runs along the bottom in a different direction. The lizard is able to stay underwater for several hours. While the basilisk's method of walking on water is different from our Lord's, its abilities come from the same God. This lizard shows the wisdom and power of God to do things that seem impossible to us, including giving forgiveness of sins and eternal life to us through His Son, Jesus Christ.